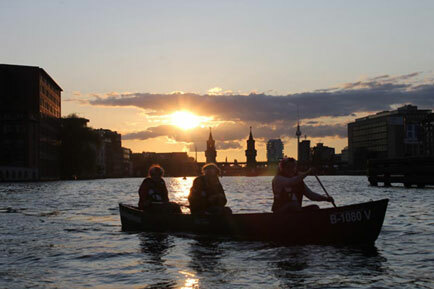 Explore Berlin by canoe. We have the right tour for everyone! Experience Berlin up close. 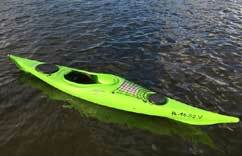 Away from crowded streets by canoe. 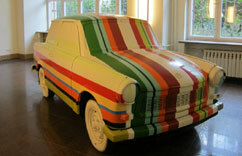 Day to day hounded thousand people from all over the world travel to the famous metropolis of Berlin. Sightseeing at Kudamm or Brandenburger Tor is definitely a must-do when visiting Berlin. But to discover Berlin behind the scenes takes much more. Backstagetourism offers guided canoe tours on the Spree river and Landwehrkanal to show you the most beautiful parts of Berlin. 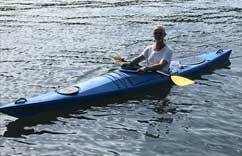 You will discover the city very close by paddling through Berlin with one of our experienced guides. 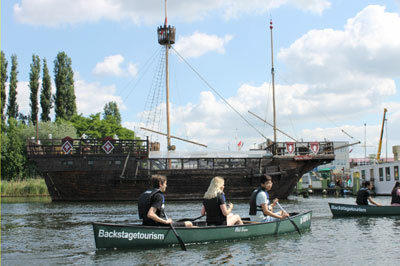 Aside of crowded streets, Backstagetourism takes you by canoe, kayak or by bike through the city of Berlin. A sightseeing tour you will never forget. 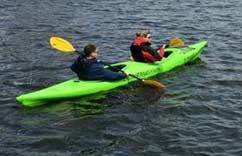 Public canoe tours take place every Saturday. 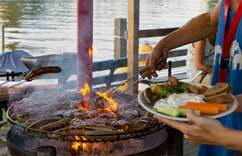 Click here for reservation. Berlin changes constantly and fast! The mix of modern architecture and historic buildings makes Berlin an attractive tourist destination. 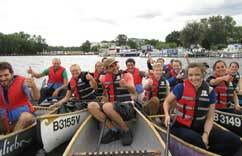 But who would ever think of exploring a city by canoe and combining history with a fun event? On our guided canoe tours we look behind the scenes and explore Berlin from a totally new perspective. Whether the former GDR such as the Nazi Prison or the former Broadcasting Centre – all of which can be easily reached by canoe. 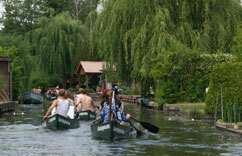 Well-known districts such as Kreuzberg or Treptow-Köpenick can be easily explored by canoe. 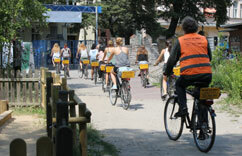 Most of tour guides are from Berlin and give background knowledge of the city with exciting stories. 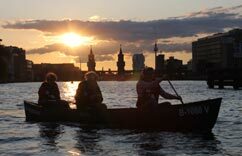 By exploring Berlin by canoe the city is at its most beautiful side! Most people are impressed how green and diverse Berlin is. 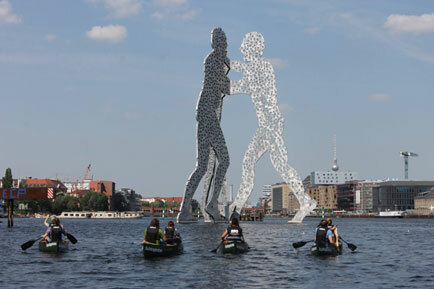 If you think of Berlin you would probably not think of canoes or a beautiful waterscape. Many people discover Berlin day to day anew. But who can actually say that he or she has discovered Berlin from the waterscape? The spree river and its numerous canals run through many famous sights in Berlin such as the TV-tower, the Molecule Men or the Oberbaum-Bridge. 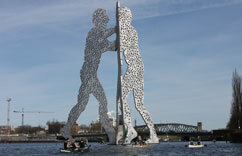 Paddle with us through Berlin and be surprised by the wonderful scene! Before the canoe tour starts, everyone gets a life jacket and a short theoretical crash course. Only then it is onto the water. “Safety first”! 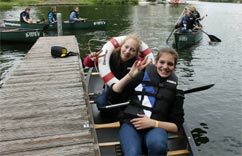 The canoe tours through Berlin are organized in such manner, that also inexperienced paddlers can participate without hesitation. 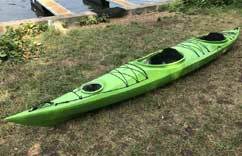 There will be several short stops at particular historical points throughout or canoe tour. 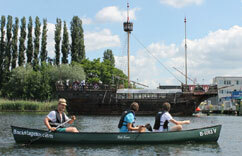 From now on we also offer public canoe tours in Berlin for individuals or small groups. 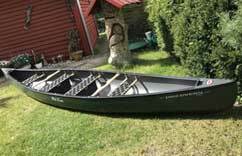 You can find more information and booking possibilities under the respective canoe tour. The public canoe tour takes place every 2nd Saturday of the month at 15 o’clock. The public canoe tour takes place on the last Saturday of the month at 14 o’clock. 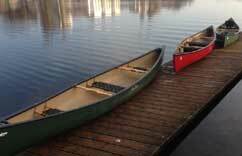 The public canoe tour takes place every 1st Friday of the month at 21 o’clock. Quer über die Spree führt es die Kanutour durch Treptow Köpenick, Kreuzberg und vorbei an Friedrichshain. Doch kann man durch Kanufahren Berlin überhaupt hautnah erleben? Man kann! Denn dieses nicht nur sportliche Event macht in regelmäßigen Abständen Halt am kulturellen und historischen Erbe der Stadt. Mit dem Kanu Berlin zu entdecken ist eine atemberaubende Reise durch die Zeit, die Sie so schnell wahrscheinlich nicht vergessen werden. Auch wenn diese Attraktion im ersten Moment ungewöhnlich erscheint, so werden Sie bereits nach kurzer Zeit feststellen, dass man mit dem Kanu Berlin aus einer anderen Perspektive sieht, und dass alles Wissenswerte auch über den Wasserweg zu erkunden ist.